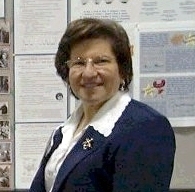 Janet Akyüz Mattei celebrates her 30th year as director of the American Association of Variable Star Observers (AAVSO). Founded in 1911, the AAVSO is one of the oldest and largest amateur organizations in the world, with members in more than 40 countries and more than 10 million observations in its database. In the summer of 1969 in the US Northeast, a young astronomy student named Janet Akyüz was looking through the telescope at Maria Mitchell Observatory on Nantucket Island and studying photographs of V2584 Sagittarii, a faint RR Lyrae-type variable star that fluctuates in brightness in less than a day. That glorious, starlit summer night was hard to beat, and for Janet and the American Association of Variable Star Observers (AAVSO), it was a summer that changed the organization's history. "Maria Mitchell Observatory is really something," Janet recalls. "It gives students an opportunity to do real research, to gather and analyze data. Each student would be given a star — our personal star — and then report about it at the annual meeting of the AAVSO the following October." This was her first real contact with the group. When October came around, the meeting was held at the same facility where she had spent her summer. Observatory director Dorrit Hoffleit (S&T, February 1999, page 89), who was attending a conference in Virginia, was due to return in time to run the AAVSO meeting, but a terrible fog prevented her from getting to Nantucket. "I let Margaret Mayall, then AAVSO director, know that Janet would handle everything until I arrived," she says. Like most AAVSO meetings, that one included a session at the observatory. "I had never seen observing as intense as that evening," says Janet. "John Bortle and Charles Scovil, two of the association's most enthusiastic observers, were looking at variables and calling out their brightness estimates one after another. Just as we were about to close the dome, two more guys came. One of them was my future husband, Michael Mattei. The two were hungry and wanted to know if there were any restaurants that were open late. The next day, we had the meeting and paper session, and that's where I gave my talk on V2584 Sagittarii." Janet was born in Bodrum, on Turkey's picturesque southwestern coast. After graduating from high school she traveled to the United States to study at Brandeis University, from which she graduated in 1965. "I started out as a physics major but wanted to take classes in as many sciences as I could," says Janet, "so I majored in general science. After graduating I still didn't know what to do with my life, so I worked at Beth Israel Hospital for a year and a half, running its cardio-pulmonary laboratory." In 1967 she returned to her native country to teach physics and mathematics. Later on she quit teaching and began graduate studies in astronomy. During this period she heard about Hoffleit's summer program on Nantucket. "Dorrit's decision to hire me as her assistant changed my life," says Janet. At the end of 1969 Janet became a member of the AAVSO and, three years later, while a graduate student at the University of Virginia, she married Michael Mattei. She also joined the AAVSO staff as Mayall's assistant the year before the longtime director decided to retire. "Why don't you apply for the position of director?" Mayall encouraged Janet. The latter had been an assistant for only six months, but at the AAVSO's council meeting in the fall of 1973, the body chose her to be director, a position she has now held for 30 years. Janet began her new job in awe. "I was frightened to death," she remembers. "Where could I direct the organization that would make a difference?" Her first decision was to begin digitizing incoming observations so computers could plot the stars' light curves automatically. It turns out that Janet began her career at the right time, just as technology was allowing the building of spaceborne observatories. In 1978 two satellites went into orbit that would have a profound influence on the future of the AAVSO. One was the High Energy Astrophysics Observatory No. 2 (HEAD 2), renamed the Einstein Observatory, carrying a sizable X-ray telescope; the other was the Inter national Ultraviolet Explorer (IUE). These satellites put visual observations at a level of importance never before seen in the AAVSO's history. Cataclysmic variable stars, which can climb several magnitudes in brightness in a matter of hours, helped turn the tide. The AAVSO's worldwide network of observers would monitor the behavior of these stars and report immediately when one of them, such as SS Cygni or U Geminorum, would go into outburst. Janet would then notify the satellites' observing teams. X-ray emissions were first detected in SS Cygni thanks to alert amateur observers. "My involvement with Janet and the AAVSO really took off in 1992 with the launch of EUVE, the Extreme Ultraviolet Explorer satellite," says Christopher W. Mauche (Lawrence Livermore National Laboratory). "I wanted to use EUVE to acquire extreme ultraviolet spectra of dwarf novae in outburst, and since these observations required [real-time] target-of-opportunity scheduling, I needed to rely on Janet and the AAVSO to inform us when one of my targets went into outburst. The first target, SS Cygni, went into outburst just as I was getting on a plane to go to Washington, DC, to serve on a NASA peer-review panel. I learned about the event when I arrived at my hotel —Janet had left a message. For some reason I was not able to get in touch with her that evening, and I spent part of a restless night trying to decide how and when to begin the EUVE observation. But when I contacted Janet in the morning, I found that she had already alerted the appropriate individuals at EUVE and NASA and had started the observations for me! I had left her with `power of attorney' and she had exercised it!" Mauche adds: "Subsequent to these studies, I have done observations of dwarf novae in outburst with the Hubble Space Telescope and the Chandra X-ray Observatory. In each case I've relied on Janet and her organization to trigger the target-of-opportunity observations." "The recent discovery of the visual afterglow of a gamma-ray burst by South African amateur astronomer Berto Monard is further testament to the fore sight and encouragement of Janet," notes gamma-ray astronomer Jerry Fishman (NASA/Marshall Space Flight Center). Monard made the discovery last July 25th from his observatory near Pretoria (see SkyandTelescope.com/news/article_ 1025_l.asp). 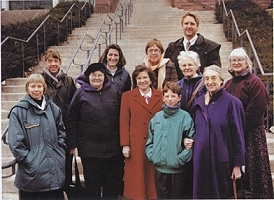 In 1997 Janet Mattei joined friends in celebrating the 90th birthday of former Maria Mitchell Observatory director Dorrit Hoffleit (second from right). In September 2003 Mattei was diagnosed with acute leukemia. As this issue goes to press, she is undergoing treatment at a Boston hospital. "Janet was determined to enter the province of the `Big Boys,' the elite professionals with their 4-meter, and larger, telescopes who are quick to seize the rapid GRB follow-up challenge every time a good location is found," says Fishman. "Her inspiration, together with the technical assistance of AAVSO members Aaron Price and Arne Henden, has now successfully thrown the organization into one of the hottest areas of high-energy astrophysics today." I remember that one AAVSO member marveled at this turn of events at the organization's meeting I attended in 1978: "I had believed that the professional astronomers had all the data they needed from us," the member said. "Years ago we were all part of the excitement of observing for researchers who needed our work. Then there came a long period in which we wondered if there was any value to what we were doing at all. Now the old excitement, the freshness, is back again." With new technology, advanced satellites, and education programs, that excitement still drives the AAVSO today. In the 1980s Janet decided to digitize all of the AAVSO's data, back to even before the organization's founding in 1911. In 1986 she welcomed AAVSO members to their new headquarters on Birch Street in Cambridge, Massachusetts, right next door to the offices of Sky & Telescope. On her 30th anniversary with the AAVSO, Janet is leading the organization into the brave new world of CCD observing. She has also begun the massive project of validating 10.5 million observations of nearly 5,000 stars against the original observing reports. "The AAVSO has grown tremendously in worldwide importance under her leadership," notes Hoffleit. "The AAVSO is made up of remarkable, dedicated amateur astronomers," Janet says. "The camaraderie is truly special and unique. I feel that the future holds even more exciting things as more observers extend their observations to fainter targets with CCDs, as more variables are discovered by professional all sky surveys, and as more data become available via the Internet. It's easy to get distracted in view of so many options that we have today. The challenge is to think big, to have a vision, and to move toward that vision." David Levy joined the AAVSO in 1974. He is the author of Observing Variable Stars: A Guide for the Beginner (Cambridge University Press, 1998).